Have you ever noticed just how much unwanted stuff you seem to find when you are packing up a house to move? Perhaps the best part of moving is that it gives you an opportunity to sort through your belongings and downsize and reorganize your life. As the premier movers in Kamloops, we would like to share the following tips on how to determine what stuff you should keep and what stuff you should get rid of before moving day. The best part about downsizing and removing unwanted stuff is that it will make your move so much easier. Less boxes means less work for either you or your moving company. Less boxes also translates into less moving costs, so getting rid of all your unnecessary belongings will also save you money. It really is a win-win situation. Once you have realized the benefits of moving with less stuff, how do you determine what to pack and what not to pack? Any clothing that has been outgrown, worn or outdated and is no longer part of your general wardrobe. Duplicate items or unused items – have a long look at your kitchen utensils and utility drawer. Forgotten items or gifts that have been kept to spare feeling or nostalgia. Broken items or belongings that are in desperate need of repair. Once you have determined what items are going to be a part of your new home and what items are not, it is time to decide what to do with these items. 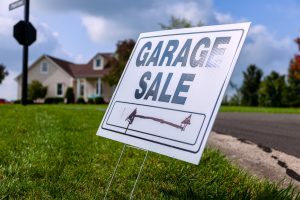 If some of your items are worth money then you should think about either selling them online or having a yard sale prior to your move. The money you get from your unwanted belongings can be put towards moving expenses to reduce costs. Another great option for your unwanted belongings is to donate them to charities such as the Salvation Army or to friends and family. Only donate items that are in good working condition and not broken or damaged items. By getting rid of your unwanted belongings, you should be able to not only reduce the number of items that you are moving, but to simplify the entire moving experience. Make sure to take advantage of the opportunity to start your life in your new home clutter free. If you would like any more tips on how to remove unwanted stuff from your home or are interested in taking advantage of the many moving services that we provide, please contact us today. We look forward to being a part of your next move.